This ivory relief depicting David and Goliath is made by Francis van Bossuit in the Netherlands in c. 1675-92. The young beardless David is shown reclining, wearing loose drapery, which reveals his upper body and legs, holding a sword in his left hand, and resting his right arm on Goliath's head. The relief is illustrated in Matthew Pool's published engravings of van Bossuit's work, The Statue's or Art's Cabinet of 1727. 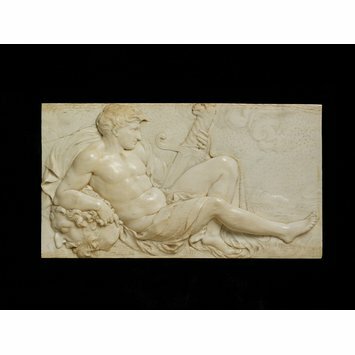 Both the smooth carving of David's body, resembling wax, and the contrasting rough dappling of the background, are typical of the artist. 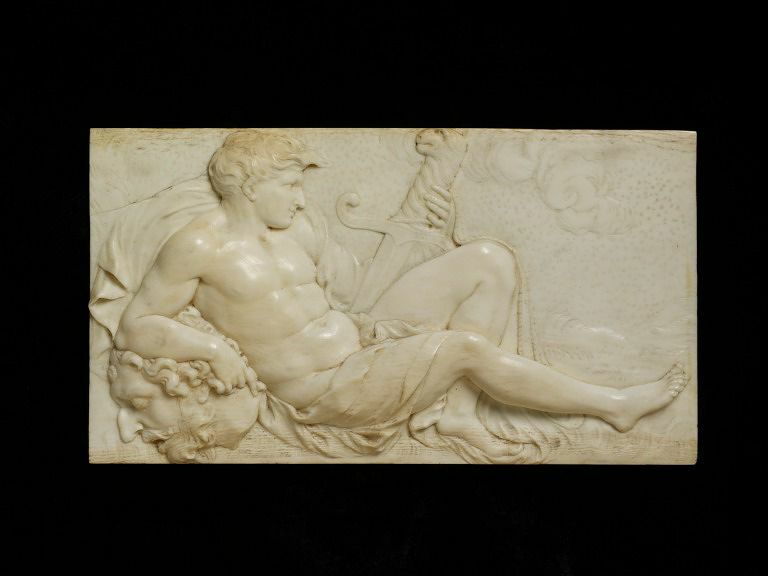 Bosuit was one of the most accomplished ivory carvers of the late 17th century and the subtlety of this relief bears out his admirers' claim that he could carve ivory "as if it was wax". It was almost certainly carved in Amsterdam, where Bossuit moved late in his career, having spent many years in Italy. The young beardless David is shown reclining, semi-draped, his left leg bent, his right leg extended, leaning against the bearded head of Goliath, and holding a sword in his left hand. Stylised clouds and grass are shown, and the rest of the background is punched, a distinctive detail of Bossuit's work. In the collection of Mary Dorothy Rittner, Herts, UK. Bought from her for £21,000 in 1989. From 1974-1989 the object was on loan to the museum from Miss Mary Dorothy Rittner. Brown, Christopher and Joyce Plesters, Art in 17th century Holland, London: the National Gallery, 1976. Bossuit was one of the most accomplished ivory carvers of the late 17th century and the subtlety of this relief bears out his admirers’ claim that he could carve ivory “as if it were wax”. This relief was almost certainly carved in Amsterdam, where Bossuit moved late in his career, having spent many years in Italy.